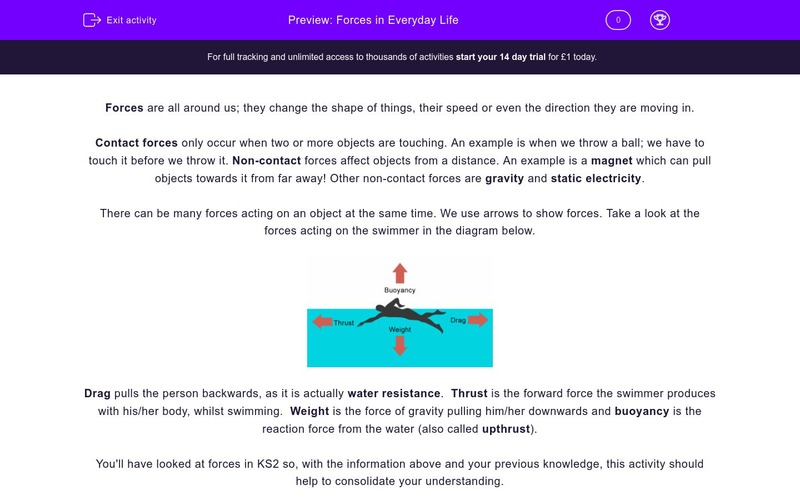 In this worksheet, students will read an introduction to forces in everyday life. Forces are all around us; they change the shape of things, their speed or even the direction they are moving in. Contact forces only occur when two or more objects are touching. An example is when we throw a ball; we have to touch it before we throw it. Non-contact forces affect objects from a distance. An example is a magnet which can pull objects towards it from far away! Other non-contact forces are gravity and static electricity. There can be many forces acting on an object at the same time. We use arrows to show forces. Take a look at the forces acting on the swimmer in the diagram below. Drag pulls the person backwards, as it is actually water resistance. Thrust is the forward force the swimmer produces with his/her body, while swimming. 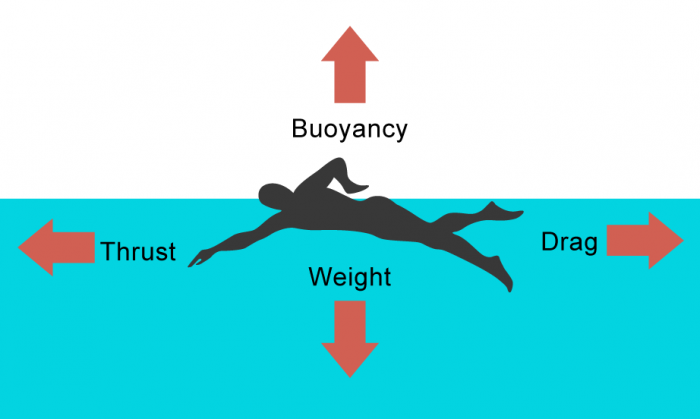 Weight is the force of gravity pulling him/her downwards and buoyancy is the reaction force from the water (also called upthrust). Where can we find forces? It this statement true or false? Contact forces can affect objects from far away. 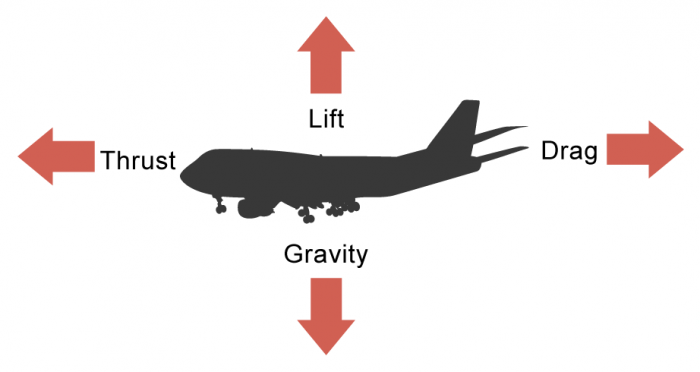 An example of a contact force is gravity. A fish swimming in water is not affected by gravity. Upthrust is another name for buoyancy. A fish swimming in the sea produces a forward force with its body which helps it to move forward. What is the name of this force? Give another name for water resistance. The diagram shows the forces acting on an aeroplane while it is flying. Think of another name for drag. 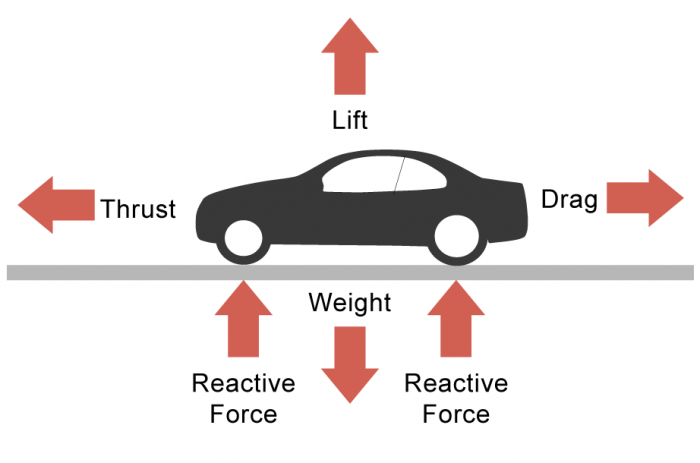 The diagram shows forces acting on a car while it is moving. Which one of these forces represents the friction between the tyres and the road surface? Friction is an example of a non-contact force. Forces are all around us. Contact forces affect objects only when they are touching. Gravity is a non-contact force. Gravity affects objects in water, too. Upthrust is another name for buoyancy. The statement is true. A fish swimming in the sea produces a forward force with its body which helps it to move forward. It is called thrust. Another name for water resistance is drag. Drag in the air is air resistance. Another name for drag acting on a car is friction. The friction between the tyres and the road surface is what slows down the car. Objects must be touching for friction to act, so friction is a contact force. The statement is false.